During the event, the Director of the foundation, Limunga Ikome and her elder brother, Daniel Duvalier Ikome, congratulated the beneficiaries for their outstanding results during the 2014/2015 academic year and encouraged them to work harder during the 2015/2016 academic year. According to the chair of the review committee of Ikom’a Manyanye Foundation scholarship award, I. K. Manyanye, those who benefitted in this year’s scholarship are; -Enjema Nenne Esunge (female) -Merongo Norantine (female) -Adeline Beme (female) -Therese Mafany (female) -Brice Ikome (male) -Mbome Hilda Nanyongo (female) -Namme Pauline Nanyongo (female) -Eleanor Kange (female) -Manyanye David (male) -Blaise N (male). Three of the recipients from the university level received CFAF 50,000 each while the seven students from secondary and high schools also received CFAF 25,000 each. 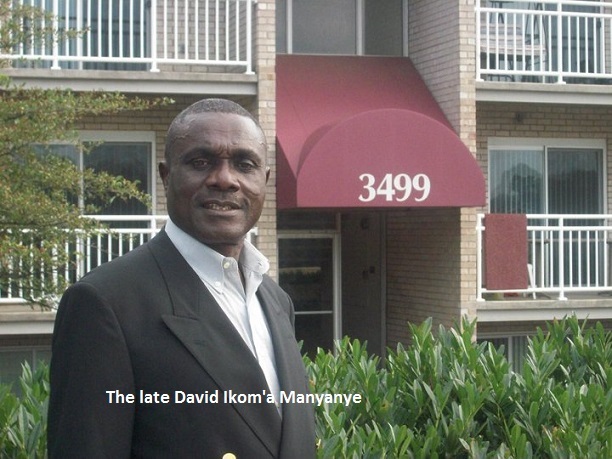 The Ikom’a Manyanye Foundation (IMF) was created in 2014 in honour of David Ikom’a Manyanye. He was a brave and gigantic soldier of the Manyanye clan in Wokwaongo village-Gbea (Buea). Late Mola David Ikom’a Manyanye was born on September 7, 1943 and died on August 11, 2013 at the Buea Regional Hospital Annex. He was buried on September 7, 2013, in his native Wokwaongo. Considering all his sacrifices made for the wellbeing of his family, his offsprings have decided to honour his name by creating this foundation.